The birds are chirping. The bees are buzzing. And the sun is shining. It’s summer: time to think about camping. Actually, you may be reading this in spring or fall and those are also great times to camp on the Mendocino Coast. With more than 75 miles of coastline and dozens of state and private campgrounds, finding a place to camp on the Mendocino Coast is not difficult. Of course, the most popular state parks fill up fast: available spaces at MacKerricher (Fort Bragg) and Russian Gulch (Mendocino) and Van Damme (Little River) go quickly on weekends. Midweek, a few spots are available, but even those are few and far between. But don’t let that discourage you. You’ll likely find space available at Hendy Woods (in Anderson Valley), Paul Dimmick (Anderson Valley) and Manchester State Beach year around. 1. Best Trails: Russian Gulch State Park’s North Trail through redwoods to a spectacular waterfall; Van Damme’s Fern Canyon Trail from the Pygmy Forest to the Ocean is not to be missed. 2. Best Campground: Van Damme’s upper meadow/forest campground. 3. Best Beach Walk: MacKerricher’s Ten Mile Beach is as spectacular as it is long. 4. Best Stream Walk: Van Damme State Park – Little River. 5. Best County Campground: Gualala Point Regional Park has a river, a trail to the beach and sites nestled in the tall trees. 6. Most Sweeping View: Westport Union Landing State Park offers a 180-degree view with the Lost Coast North and Fort Bragg Headlands South. 7. Best Campground On The Beach: Navarro River Beach offers camping next to a driftwood-strewn sandy stretch, which adjoins the Navarro River and offers sunsets that river Big Sur. 8. Best Campground/RV Park/Beach: Caspar State Beach: you camp at Caspar RV park (tent and RV spaces) with a beautiful, protected beach separated only by a rural two-lane road. 9. Best Bicycle Trail in a Campground: MacKerricher’s paved Haul Road, which bisects the park between camping areas and the ocean. You can ride into downtown Fort Bragg or down to Ten Mile Beach. 10. 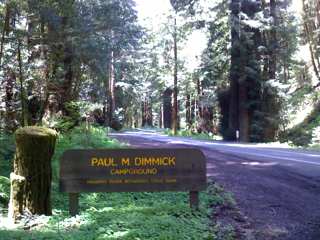 Best Redwoods: Paul M. Dimmick Campground is nestled among Navarro River Redwoods State Park, along Highway 28. California State Parks Camping Reservations: 1-800-444-PARK (7275) or click at left for online reservations. Consult links below for private campground contact information. Gualala River Redwood Park (at the Mendocino/Sonoma County line) – campground along the Gualala River in the redwoods. Gualala Point Regional (County) Park – this is one of our favorites: in a beautiful redwood grove next to the river and access to trails that take you the the ocean and along the public access bluff trail at Sea Ranch. Anchor Bay Campground – 5-acres nestled in a narrow gulch filled with redwoods. Located in the “banana belt,” on one of California’s most beautiful beaches. This is the only campground with direct access to Anchor Bay’s ¾ mile long Fish Rock Beach. Manchester Beach KOA – RV resort & family campground off Shoreline Highway One among the pines and rhododendrons. Walk to 5-mile long driftwood beach. 124 total sites, including spacious RV (full hookup) sites, tent sites, plus Kamping Kabins and Kamping Kottages. Manchester State Park – Located just behind the KOA, it is set among the dunes a mile off Highway 1. Often cooled by summer fog. But who wouldn’t want to beat the 100-degree heat inland. And you have views of the Point Arena Lighthouse to the south, miles of beach to explore and and are just a few miles from the new Stornetta preserve – a wonder of cliffs, big waves, a waterfall and stunning views. Navarro River Redwoods State Park – there are two great camping spots here: Paul Demmick Campground, set in a grove of Old Growth Redwoods, six miles each of Highway 1. Beautiful setting, but right next to the Highway 128, which is extremely lightly travelled in the evening. I’ve stood in among the trees along the side of the road, after driving from the Bay Area, and had no cars come through for five minutes. And that is mid-day. Navarro River Beach – where the Navarro River meets the ocean, this is a dramatic setting nestled along the river and high cliffs. Albion River Campground and Marina – a jumping off point for diving, fishing and adventure on the Mendocino Coast, the campground is tucked between two ridges with ocean views and has a popular cafe, called Flat’s. Van Damme State Park – may be the best State Park in America: the meadow campground provides campsites in a sunny meadow or in the surrounding big trees — sun or shade. You take your pick. Van Damme has a beach where Craig Comen at Kayak Mendocino will take you into sea caves. You can cross the highway and walk in the Spring Ranch section of the park where you can sit on a carved-out redwood bench to view big waves, see harbor seals in the cove to the far south. By foot or car, you can walk in one of just three pygmy forests in the U.S. — one of a handful in the entire world. The Fern Canyon Loop, which is about 3.5 miles takes you back in time. Caspar State Beach – You can’t camp on the beach here, but across the street is the Caspar Beach RV Park & Campground, a few spots for tents, and a lot of trailer and RV sites. You’ve got a store here, soft board and kayak rentals, and the beach itself is a popular surfing spot. You can walk, and you can have a fire on the beach. A pleasant place for a picnic. •A board walk allows you to get out close to the ocean — for wildlife and whale watching (December-April/May) without damaging the habitat. •The “haul road” (trucks used to haul lumber out of the forests) is a bike, hike and run trail that extends for several miles. Fort Bragg Leisure Time RV Park – From Junction of Highway 1 and Highway 20, go 2 miles east on Highway 20. Nestled among the pines with open and shaded campsites. Leisure Time has 57 campsites and 32 with full hookups, 13 with partial hookups with water and electric.